6/11/11 – Looking for A Missal? Since we have started using the new translation of the Order of Mass, we have relied on projection systems and pew cards to recall the texts of prayers we used to know off by heart. We will also come to know these new words by memory over time. In the meantime, many of us like having access to a copy of the prayers, even if it’s something to fall back on when we have a forgetful moment. Perhaps your old Sunday Missal is getting a bit tired and worn out like these ones? 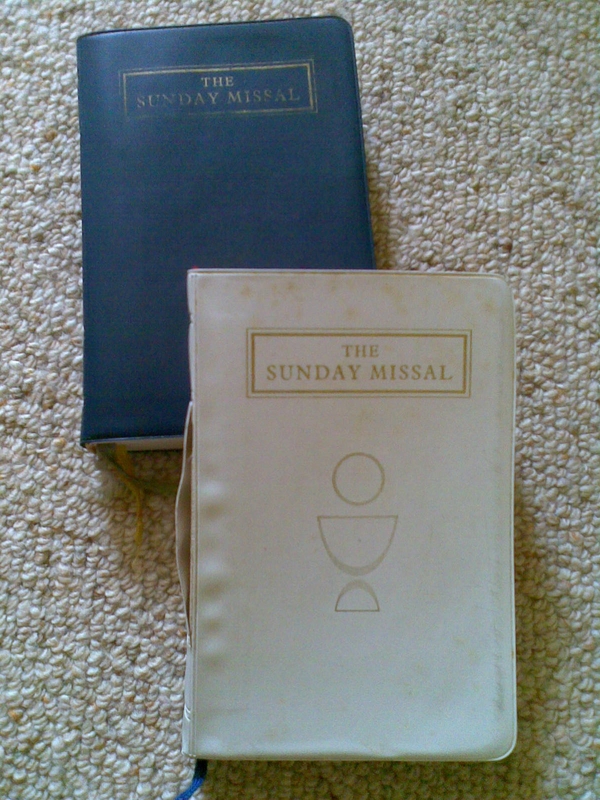 A number of people have asked when a Sunday missal will be available to purchase. There are several missal options becoming available during this month and beyond. As I mentioned before, it is understandable that people would like to have a copy to refer to until the new words “roll off the tongue”. A personal missal or Mass book can be useful when we are not familiar with the texts and need a copy to follow. When Mass was still celebrated in Latin, many people followed the Mass through the pages of a missal. The Latin texts were printed on the left-hand side, with an English translation on the right. For the majority of us who can hear and understand what is said at Mass, a personal missal or Mass book should ultimately be used as a preparation tool. Once we’ve managed to memorise the new translations of our responses and prayers at Mass, we should leave the missal at home. It is at home where a missal is particularly useful. We can use a missal at home as a tool for our own personal preparation, reflection and prayer. We can spend the week reading and reflecting further upon the scripture readings we have heard proclaimed on Sunday. We can read over prayers such as the Collect (Opening Prayer) and use them in our own prayer during the days that follow, coming to a deeper understanding of the messages they are communicating. Given that we have now been using the new translation of the Order of Mass for almost six months now, we will soon look at removing the prayers and responses from the projection system at Masses so that we do not become dependent it. We will, however, continue to make the pew cards available at the church doors for those who require them.